Brand new styles from Cofra with full S3 protection. Breathable and antibacterial textile Lining. Dual density PU sole allows for foot's natural movements helping to reduce foot fatigue. Perfect Step Sole is a new technology that has resulted in a new generation of soles with guarantee maximum comfort by quickly adapting to foot morphology. 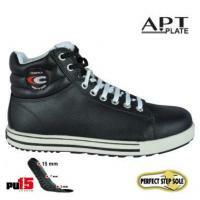 PU15 Insole Anatomic and antistatic made of highly shock absorbing scented PU. The 15mm thickness in the heel area enhances the shock absorption and dissipates energy, by uniformly distributing the weight throughout the foot area. The antibacterial upper layer prevents nasty odours and absorbs moisture. Aluminium 200J toe cap and Kevlar 100% Anti-Perforation Textile Plate REDUCE weight of shoe by 45%.